Being a member of the Kazunel clan means accepting certain responsibilities. One of those responsibilities involves passing on to the next generation one of the clan's defining skills... that of forging weapons. However to pass on a skill one has first to learn that skill. I am ashamed to say that it has taken me many years to appreciate that. 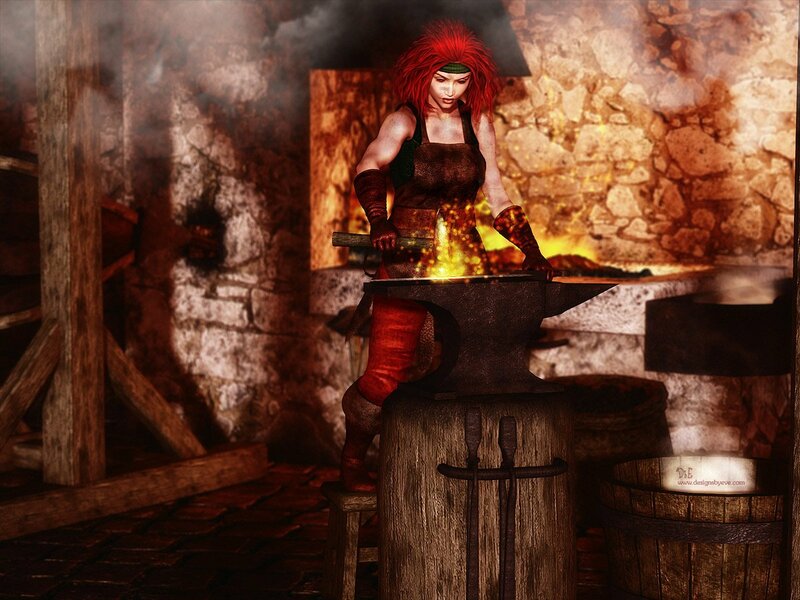 But on Feastday, day 16 of the month Lormesta in the year 5110 I visited one of the blacksmith's workshops in Wehnimer's Landing to begin to perfect the art of weapon making. I intend to chart my successes and failures in the art of making the perfect weapon. I will make reference to the resources used, written and verbal, in my attempt to master these skills. It should be noted that I will record my trials and tribulations with little reference to the technical elements that so exercise the minds of those more scholarly than myself. 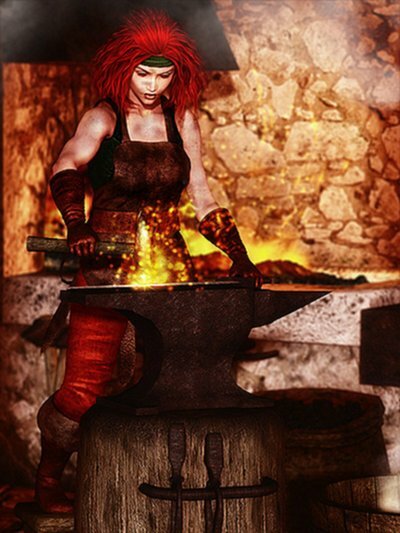 I am interested in what the landing folk would I suppose call 'the human element' and what I as a dwarf would term 'the more personal element' - the time, the commitment and the dedication that goes to becoming a master blacksmith. If I slip in a few technical comments, then trust me... it will be by accident. Forging is the art of manipulating metal, usually by using a hammer and anvil on metal subjected to high temperatures, which allows its manipulation. Anyone can forge with a modicum of training. But not everyone can forge well. It take time and dedication to learn this artisan skill. 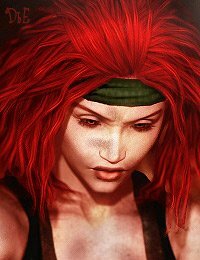 Reading these scrolls gave me an re-appreciation of forging. I wandered over to the public workshop supply stalls. A tin-clad counter occupies the center of the stall, and a large sign hangs from the main post that rises in the stall's center. An almost grim faced half-elf, with broad shoulders and muscled biceps, stands behind the counter, a polished mithril toothpick held in her teeth. I purchased a leather crafter's apron from Samilla and put it on. After that I purchased a bronze bar and then paid 300 silvers to rent some time in one of the vacant workshops. Uneven gaps between the rough-hewn planks of the walls make it clear that the workshop's walls are intended to only block out the worst of the weather. Crowded with a grinder, polisher and a workbench with a vise, this room is perhaps a third of the building's interior. Besides the exit, a red iron door pierces the center of the hut's one interior wall. For whatever reason, the bases of the workbench, grinder and polisher have each been carved with images of scampering rats. You also see a wooden bin, a rental hourglass and a large sign. I looked at the workbench. On the sturdy workbench you see a diamond-jawed slab-cutter, a glaes forging-hammer handle-glyph and a glaes forging-hammer head-glyph. I stared at the gylph that I needed - in this case a forging-hammer glyph. You carefully trace the forging-hammer pattern onto the surface of the bronze in your hand. Your material is marked with a pattern, next you'll need to shape it somehow. Glancing around you see a grinder that may suit your needs. Roundtime: 30 sec.